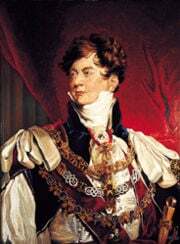 George IV (George Augustus Frederick; August 12, 1762 – June 26, 1830) was king of the United Kingdom of Great Britain and Ireland and Hanover from January 29, 1820 until his death. He had earlier served as The Prince Regent when his father, George III, suffered from a relapse into insanity from an illness that is now suspected to have been porphyria. The Regency, George's nine-year tenure as Prince Regent, which commenced in 1811 and ended with George III's death in 1820, was marked by victory in the Napoleonic Wars in Europe. George was a stubborn monarch, often interfering in politics, especially in the matter of Catholic emancipation, though not as much as his father. For most of George's regency and reign, Lord Liverpool controlled the government as Prime Minister. George is remembered largely for the extravagant lifestyle that he maintained as prince and monarch. He had a poor relationship with both his father and his wife, Caroline of Brunswick, whom he even forbade to attend his coronation. He was a patron of new forms of leisure, style and taste. He commissioned architect John Nash to build the Royal Pavilion in Brighton, and the re-building of Windsor Castle. He was largely instrumental in the foundation of the National Gallery, London and King's College London. Upon his birth at St James's Palace, London on August 12, 1762, he automatically became Duke of Cornwall and Duke of Rothesay; he was created Prince of Wales and Earl of Chester a few days afterwards. On September 18 of the same year, he was baptized by Thomas Secker, Archbishop of Canterbury. His godparents were the Duke of Mecklenburg-Strelitz (his uncle), the Duke of Cumberland (his great-uncle) and the Dowager Princess of Wales (his grandmother). George was a talented student, quickly learning to speak French, German and Italian in addition to his native English. The Prince of Wales turned 21 in 1783, and obtained a grant of £60,000 from Parliament and an annual income of £50,000 from his father. He then established his residence in Carlton House, where he lived a profligate life. Animosity developed between the prince and his father, a monarch who desired more frugal behavior on the part of the heir-apparent. The King, a political conservative, was also alienated by the Prince of Wales's adherence to Charles James Fox and other radically-inclined politicians. Soon after he reached the age of 21, the Prince of Wales fell in love with a Roman Catholic, Maria Anne Fitzherbert, who was a widow twice over; her first husband, Edward Weld, died in 1775, and her second husband, Thomas Fitzherbert, in 1781. A marriage between the two was prohibited by the Act of Settlement 1701, which declared those who married Roman Catholics ineligible to succeed to the Throne. 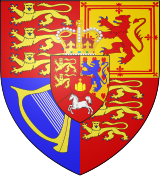 In addition, under the Royal Marriages Act 1772 the Prince of Wales could not marry without the consent of the King, which would have never been granted. Nevertheless, the couple contracted a marriage on 15 December 1785 at her house in Park Lane, Mayfair. Legally the union was void as the King's assent was never requested. However, Mrs. Fitzherbert believed that she was the Prince of Wales's canonical and true wife, holding the law of the Church to be superior to the law of the State. For political reasons, the union remained secret and Mrs. Fitzherbert promised not to publish any evidence relating to it. The Prince of Wales was plunged into debt by his exorbitant lifestyle. His father refused to assist him, forcing him to quit Carlton House and live at Mrs Fitzherbert's residence. In 1787, the Prince of Wales's allies in the House of Commons introduced a proposal to relieve his debts with a parliamentary grant. The prince's personal relationship with Mrs Fitzherbert was suspected, but revelation of the illegal marriage would have scandalized the nation and doomed any parliamentary proposal to aid him. Acting on the prince's authority, the Whig leader Charles James Fox declared that the story was a calumny. Mrs Fitzherbert was not pleased with the public denial of the marriage in such vehement terms and contemplated severing her ties to the prince. He appeased her by asking another Whig, Richard Brinsley Sheridan, to restate Fox's forceful declaration in more careful words. Parliament, meanwhile, was sufficiently pleased to grant the Prince of Wales £161,000 for the payment of his debts, in addition to £60,000 for improvements to Carlton House. Based on DNA sequencing of the House of Hanover and the House of Windsor, it is likely that George III suffered the hereditary disease porphyria. In the summer of 1788, the King's mental health deteriorated, but he was nonetheless able to discharge some of his duties. Thus, he was able to declare Parliament prorogued from September 25, to November 20. During the prorogation, however, George III became deranged, posing a threat to his own life, and when Parliament reconvened in November the King could not deliver the customary Speech from the Throne during the State Opening of Parliament. Parliament found itself in an untenable position; according to long-established law, it could not proceed to any business until the delivery of the King's Speech at a State Opening. Although theoretically barred from doing so, Parliament began debating a Regency. In the House of Commons, Charles James Fox declared his opinion that the Prince of Wales was automatically entitled to exercise sovereignty during the King's incapacity. A contrasting opinion was held by the Prime Minister, William Pitt the Younger, who argued that, in the absence of a statute to the contrary, the right to choose a Regent belonged to Parliament alone. He even stated that, without parliamentary authority "the Prince of Wales had no more right… to assume the government, than any other individual subject of the country." Though disagreeing on the principle underlying a Regency, Pitt agreed with Fox that the Prince of Wales would be the most convenient choice for a Regent. The Prince of Wales—though offended by Pitt's boldness—did not lend his full support to Fox's philosophy. The Prince's brother, Prince Frederick, Duke of York, declared that the prince would not attempt to exercise any power without previously obtaining the consent of Parliament. Following the passage of preliminary resolutions, Pitt outlined a formal plan for the Regency, suggesting that the powers of the Prince of Wales be greatly limited. Among other things, the Prince of Wales would not be able either to sell the King's property or to grant a peerage to anyone other than a child of the King. The Prince of Wales denounced Pitt's scheme, declaring it a "project for producing weakness, disorder, and insecurity in every branch of the administration of affairs." In the interests of the nation, both factions agreed to compromise. A significant technical impediment to any Regency Bill involved the lack of a Speech from the Throne, which was necessary before Parliament could proceed to any debates or votes. The Speech was normally delivered by the King, but could also be delivered by royal representatives known as Lords Commissioners, but no document could empower the Lords Commissioners to act unless the Great Seal of the Realm was affixed to it. The Seal could not be legally affixed without the prior authorization of the Sovereign. Pitt and his fellow ministers ignored the last requirement and instructed the Lord Chancellor to affix the Great Seal without the King's consent, as the act of affixing the Great Seal gave, in itself, legal force to the Bill. This legal fiction was denounced by Edmund Burke as a "glaring falsehood", as a "palpable absurdity", and even as a "forgery, fraud". The Prince of Wales's brother, the Duke of York, described the plan as "unconstitutional and illegal." Nevertheless, others in Parliament felt that such a scheme was necessary to preserve an effective government. Consequently, on February 3, 1789, more than two months after it had convened, Parliament was formally opened by an "illegal" group of Lords Commissioners. The Regency Bill was introduced, but, before it could be passed, the King recovered. Retroactively, the King declared that the instrument authorizing the Lords Commissioners to act was valid. The Prince of Wales's debts continued to climb; his father refused to aid him unless he married his cousin, Caroline of Brunswick. In 1795, the Prince of Wales acquiesced, and they were married on April 8, 1795 at the Chapel Royal, St James's Palace. The marriage, however, was disastrous; each party was unsuited to the other. The two were formally separated after the birth of their only child, Princess Charlotte, in 1796, and remained separated for the rest of their lives. The Prince of Wales remained attached to Mrs Fitzherbert for the rest of his life, despite several periods of estrangement. Before meeting Mrs Fitzherbert, the Prince of Wales may have fathered several illegitimate children. His mistresses included Mary Robinson, an actress who was bought off with a generous pension when she threatened to sell his letters to the newspapers; Grace Elliott, the divorced wife of a physician; and Frances Villiers, Countess of Jersey, who dominated his life for some years. In later life, his mistresses were Isabella Seymour-Conway, Marchioness of Hertford, and finally, for the last ten years of his life, Elizabeth Conyngham, Marchioness Conyngham. Meanwhile, the problem of the Prince of Wales's debts, which amounted to the extraordinary sum of £630,000 in 1795, was solved (at least temporarily) by Parliament. Unwilling to make an outright grant to relieve these debts, it provided him an additional sum of £65,000 per annum. In 1803, a further £60,000 was added, and the Prince of Wales's debts of 1795 were finally cleared in 1806, although the debts he had incurred since 1795 remained. In 1804 a dispute arose over the custody of Princess Charlotte, which led to her being placed in the care of the King, George III. It also led to a Parliamentary Commission of Enquiry into Princess Caroline's conduct after the Prince of Wales accused her having an illegitimate son. The investigation cleared Caroline of the charge but still revealed her behavior to be extraordinarily indiscreet. As the Prince of Wales became Prince Regent on 5 January,, one of the most important political conflicts facing the country concerned Catholic emancipation, the movement to relieve Roman Catholics of various political disabilities. The Tories, led by the Prime Minister, Spencer Perceval, were opposed to Catholic emancipation, while the Whigs supported it. At the beginning of the Regency, the Prince of Wales was expected to support the Whig leader, William Wyndham Grenville, 1st Baron Grenville. He did not, however, immediately put Lord Grenville and the Whigs in office. Influenced by his mother, he claimed that a sudden dismissal of the Tory government would exact too great a toll on the health of the King (a steadfast supporter of the Tories), thereby eliminating any chance of a recovery. In 1812, when it appeared highly unlikely that the King would recover, the Prince of Wales again failed to appoint a new Whig administration. Instead, he asked the Whigs to join the existing ministry under Spencer Perceval. The Whigs, however, refused to co-operate because of disagreements over Catholic emancipation. Grudgingly, the Prince of Wales allowed Perceval to continue as Prime Minister. When, on May 10 1812, John Bellingham assassinated Spencer Perceval, the Prince Regent was prepared to reappoint all the members of the Perceval ministry under a new leader. The House of Commons formally declared its desire for a "strong and efficient administration", so the Prince Regent then offered leadership of the government to Richard Wellesley, 1st Marquess Wellesley, and afterwards to Francis Rawdon-Hastings, 2nd Earl of Moira. He doomed the attempts of both to failure, however, by forcing each to construct a bipartisan ministry at a time when neither party wished to share power with the other. Possibly using the failure of the two peers as a pretext, the Prince Regent immediately reappointed the Perceval administration, with Robert Banks Jenkinson, 2nd Earl of Liverpool, as Prime Minister. The Tories, unlike Whigs such as Charles Grey, 2nd Earl Grey, sought to continue the vigorous prosecution of the war in Continental Europe against the powerful and aggressive Emperor of the French, Napoleon I. Russia, Prussia, Austria, the United Kingdom and several smaller countries defeated Napoleon in 1814. In the subsequent Congress of Vienna, it was decided that the Electorate of Hanover, a state that had shared a monarch with Britain since 1714, would be raised to a Kingdom. Napoleon made a return in 1815, but was defeated at the Battle of Waterloo by Arthur Wellesley, 1st Duke of Wellington, the brother of the Marquess Wellesley. Also in 1815, the British-American War of 1812 was brought to an end, with neither side victorious. 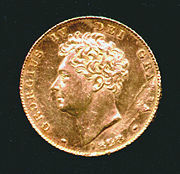 Half-Crown of George IV, 1821. The inscription reads GEORGIUS IIII D[ei] G[ratia] BRITANNIAR[um] REX F[idei] D[efensor] (George IV, by the grace of God King of the Britains (British kingdoms), Defender of the Faith). 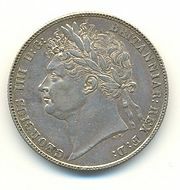 George IV was the last British King to be shown on coins wearing a Roman-style laurel wreath. When George III died in 1820, the Prince Regent ascended the throne as George IV, with no real change in his powers. By the time of his accession, he was obese and possibly addicted to laudanum. George IV's relationship with his wife Caroline had deteriorated by the time of his accession. They had lived separately since 1796, and both were having affairs. Caroline had later left the United Kingdom for Europe, but she chose to return for her husband's coronation, and to publicly assert her rights. However, George IV refused to recognize Caroline as Queen, commanding British ambassadors to ensure that monarchs in foreign courts did the same. By royal command, Caroline's name was omitted from the liturgy of the Church of England. The King sought a divorce, but his advisors suggested that any divorce proceedings might involve the publication of details relating to the King's own adulterous relationships. Therefore, he requested and ensured the introduction of the Pains and Penalties Bill 1820, under which Parliament could have imposed legal penalties without a trial in a court of law. The bill would have annulled the marriage and stripped Caroline of the title of Queen. The bill proved extremely unpopular with the public, and was withdrawn from Parliament. George IV decided, nonetheless, to exclude his wife from his coronation at Westminster Abbey, on July 19, 1821. Caroline fell ill that day and died soon afterwards, on August 7 of the same year; during her final illness she often stated that she thought she had been poisoned. George's coronation was a magnificent and expensive affair, costing about £243,000 (for comparison, his fathers coronation had only cost about £10,000). Despite the enormous cost, it was a popular event. In 1821 the King became the first monarch to pay a state visit to Ireland since Richard II of England. The following year he visited Edinburgh for "one and twenty daft days." His visit to Scotland, organized by Sir Walter Scott, was the first by a reigning British monarch since Charles I went there in 1633. George IV spent most of his reign in seclusion at Windsor Castle, but he continued to interfere in politics. At first, it was believed that he would support Catholic emancipation, as, in 1797, he had proposed a Catholic Emancipation Bill for Ireland, but his anti-Catholic views became clear in 1813 when he privately canvassed against the ultimately defeated Catholic Relief Bill of 1813. By 1824 he was denouncing Catholic emancipation in public. Having taken the coronation oath on his accession, George now argued that he had sworn to uphold the Protestant faith, and could not support any pro-Catholic measures. The influence of the Crown was so great, and the will of the Tories under Prime Minister Lord Liverpool so strong, that Catholic emancipation seemed hopeless. In 1827, however, Lord Liverpool retired, to be replaced by the pro-emancipation Tory George Canning. When Canning entered office, the King, who was hitherto content with privately instructing his ministers on the Catholic Question, thought it fit to make a public declaration to the effect that his sentiments on the question were those his revered father, George III. Canning's views on the Catholic Question were not well received by the most conservative Tories, including the Duke of Wellington. As a result, the ministry was forced to include Whigs. Canning died later in that year, leaving Frederick John Robinson, 1st Viscount Goderich to lead the tenuous Tory-Whig coalition. Lord Goderich left office in 1828, to be succeeded by the Duke of Wellington, who had by that time accepted that the denial of some measure of relief to Roman Catholics was politically untenable. With great difficulty, Wellington obtained the King's consent to the introduction of a Catholic Relief Bill on January 29, 1829. Under pressure from his fanatically anti-Catholic brother, the Duke of Cumberland, the King withdrew his approval and in protest the Cabinet resigned en masse on March 4. The next day the King, now under intense political pressure, reluctantly agreed to the Bill and the ministry remained in power. Royal Assent was finally granted to the Catholic Relief Act on 13 April. 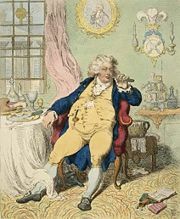 George IV's heavy drinking and indulgent lifestyle took its toll on his health by the late 1820s. His taste for huge banquets and copious amounts of alcohol meant that he put on weight and eventually he became obese. By 1797 his weight had reached 17 stone 7 pounds (111 kg or 245 lbs), and by 1824 his corset was made for a waist of 50 inches (127 cm). This made him the target of ridicule on the rare occasions that he did appear in public. Furthermore, he suffered from gout, arteriosclerosis, cataracts and possible porphyria; he would spend whole days in bed and suffered spasms of breathlessness that would leave him half-asphyxiated. He died at about half-past three in the morning of June 26, 1830 at Windsor Castle; he called out "Good God, what is this?" clasped his page's hand and said, "my boy, this is death." He was buried in St George's Chapel, Windsor on July 15. His daughter, Princess Charlotte Augusta of Wales, had died from post-partum complications in 1817, after delivering a still-born son; and his eldest younger brother, Frederick, the Duke of York, had died in 1827. He was therefore succeeded by another of his brothers, Prince William, Duke of Clarence, who reigned as William IV. An unflattering 1819 caricature by George Cruikshank, illustrating The Political House that Jack Built by William Hone (1820). There never was an individual less regretted by his fellow-creatures than this deceased king. What eye has wept for him? What heart has heaved one throb of unmercenary sorrow? …. If he ever had a friend—a devoted friend in any rank of life—we protest that the name of him or her never reached us. 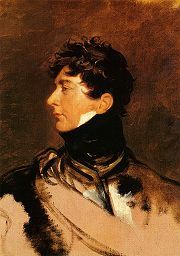 During the political crisis caused by Catholic emancipation, the Duke of Wellington said that George was "the worst man he ever fell in with his whole life, the most selfish, the most false, the most ill-natured, the most entirely without one redeeming quality", but his eulogy delivered in the House of Lords called George "the most accomplished man of his age" and praised his knowledge and talent. Wellington's true views probably lie somewhere between these two extremes; as he said later, George was "a magnificent patron of the arts… the most extraordinary compound of talent, wit, buffoonery, obstinacy, and good feeling—in short a medley of the most opposite qualities, with a great preponderance of good—that I ever saw in any character in my life." George IV was described as the "First Gentleman of England" on account of his style and manners. Certainly, he possessed many good qualities; he was bright, clever and knowledgeable, but his laziness and gluttony led him to squander much of his talent. As The Times once wrote, he would always prefer "a girl and a bottle to politics and a sermon." There are many statues of George IV, a large number of which were erected during his reign. Some in the United Kingdom include a bronze statue of him on horseback by Sir Francis Chantry in Trafalgar Square, another of him on horseback at the end of the Long Walk in Windsor Great Park and another outside the Royal Pavilion in Brighton. In Edinburgh, George IV Bridge is a main street linking the Old Town High Street to the south over the ravine of the Cowgate, designed by the architect Thomas Hamilton in 1829 and completed in 1835. King's Cross, now a major transport hub sitting on the border of Camden and Islington in north London, takes its name from a short-lived monument erected to George IV in the early 1830s. From Roman times the area had been known as 'Battle Bridge'. The Regency period saw a shift in fashion that was largely determined by George. After political opponents put a tax on wig powder, he abandoned wearing a powdered wig in favor of natural hair. He wore darker colors than had been previously fashionable as they helped to disguise his size, favored pantaloons and trousers over knee breeches because they were looser, and popularized a high collar with neck cloth because it hid his double chin. His visit to Scotland in 1822 led to the revival, if not the creation, of Scottish tartan dress as it is known today. In the third installment of the BBC comedy series Blackadder, George IV (as Prince Regent) was played as an unsympathetic buffoon by the English actor Hugh Laurie. Much of the humor of the characterization was derived from the real Prince of Wales's spendthrift ways. An offhand remark by Blackadder for the Prince to "take out those plans for the beach house at Brighton," for instance, was a reference to the actual Oriental Pavillion at Brighton. At the conclusion of the series, Blackadder has taken advantage of mistaken identity to assume the identity of the Prince of Wales. George IV (as Prince of Wales) was played by Rupert Everett in the 1994 film The Madness of King George, and by Peter Ustinov in the 1954 film Beau Brummell. The Prince Regent is also portrayed as the leader of the elite party set in the movie Princess Caraboo, which starred Phoebe Cates and was set in 1817. Julian Fellowes plays the Prince Regent in The Scarlet Pimpernel, the 1982 television version of the novel, in which Anthony Andrews and Jane Seymour also star. He appears as a character in Bernard Cornwell's novel Sharpe's Regiment, which is set during the Regency period. He is portrayed as fat, extravagant and possibly suffering from the same insanity which had afflicted his father. He is an enthusiastic fan of Richard Sharpe's military exploits, and claims to have been present at the Battle of Talavera and to have helped Sharpe capture a French standard. In the novel's historical note, Cornwell said he based the remark on an historical incident when George, during a dinner party at which Wellington was present, claimed to have led a charge at Waterloo. George IV's official style as King of the United Kingdom was "George the Fourth, by the Grace of God, of the United Kingdom of Great Britain and Ireland King, Defender of the Faith." He was also King of Hanover. ↑ E. A. Smith, George IV (New Haven, CT: Yale University Press, 1999, ISBN 0300076851), 1, 2. ↑ 20.0 20.1 Derry, 109. ↑ 23.0 23.1 David, 150–205. ↑ Mike Ashley. The Mammoth Book of British Kings and Queens. (London: Robinson, 1998. ISBN 1841190969), 684. ↑ Arthur Donald Innes, A History of England and the British Empire, Vol. 4. (London: The MacMillan Company, 1915), 50. ↑ Innes, Vol. 4, 1915, 82. ↑ John Prebble. The King's Jaunt: George IV in Scotland, 1822. (Edinburgh: Birlinn Limited, 2000, ISBN 1841580686). ↑ Michael De-la-Noy, George IV. (Stroud, Gloucestershire: Sutton Publishing,1998, ISBN 0750918217), 43. ↑ Steven Parissien, George IV: The Grand Entertainment. (London: John Murray, 2001, ISBN 071955652X), 171. ↑ The Times (London) July 15, 1830, quoted in Hibbert, 342. ↑ John Clarke. "George IV" The Lives of the Kings and Queens of England (Knopf, 1975), 225. ↑ According to The private letters of Princess Lieven to Prince Metternich, 1820–1826 edited by Quennell (1937), the King merely pretended to have fought at Waterloo disguised as General Bock to annoy the Duke of Wellington. ↑ "By His Royal Highness the Prince of Wales, Regent of the United Kingdom of Great Britain and Ireland, in the Name and on the Behalf of His Majesty, A Proclamation." The London Gazette, June 29, 1816. 17149: 1237–1238. David, Saul. Prince of Pleasure: The Prince of Wales and the Making of the Regency. New York: Grove Press, 2000. ISBN 0802137032. De-la-Noy, Michael 1998. George IV. Stroud, Gloucestershire: Sutton Publishing. ISBN 0750918217. Derry, John W. The Regency Crisis and the Whigs. Cambridge University Press, 1963. ISBN 978-0521048217. Erskine May, Thomas, 1st Baron Farnborough. The Constitutional History of England Since the Accession of George the Third, 1760–1860, 11th ed., 1896. London: Longmans, Green and Co.
Fraser, Antonia (ed.). The Lives of the Kings and Queens of England. University of California Press, 2000. ISBN 978-0520224605. Hibbert, Christopher. George IV, Prince of Wales, 1762–1811. London: Longman, 1972. ISBN 0582126754. Hibbert, Christopher. George IV, Regent and King, 1811–1830. London: Allen Lane, 1973. ISBN 0713904879. Innes, Arthur Donald. A History of England and the British Empire, Vol. 3. London: The MacMillan Company, 1914. Vol. 4, 1915. Macalpine, Ida, and Richard Hunter, "The 'insanity' of King George III: a classic case of porphyria." Brit. Med. Journal 1 (1966): 65–71. Parissien, Steven. George IV: The Grand Entertainment. London: John Murray, 2001. ISBN 071955652X. Prebble, John. The King's Jaunt: George IV in Scotland, 1822. Edinburgh: Birlinn Limited, 2000. ISBN 1841580686. Röhl, J. C. G., M. Warren, and D. Hunt. Purple Secret: Genes, 'Madness' and the Royal Houses of Europe. Bantam Press, 1998. ISBN 0552145505. Rutherford, Jessica M. F. The Royal Pavilion: The Palace of George IV. Brighton, UK: Brighton Borough Council, 1995. ISBN 0948723211. Smith, E. A. George IV. New Haven: Yale University Press, 1999. ISBN 0300076851. Tarkow, I. Naamani. "The Significance of the Act of Settlement in the Evolution of English Democracy." Political Science Quarterly 58 (4)December, 1943: 537–561. History of "George IV of the United Kingdom"
This page was last modified on 15 June 2017, at 22:14.